The Maligne Lodge offers warmth and hospitality. A short walk away from the historical locations of the Jasper town center, the Maligne Lodge offers the peace and serenity you would expect to find in this mountain ski resort town. Buckles Restaurant and Saloon offers traditional western hospitality, with a menu that won't leave you hungry. The facilities include luxurious rooms and suites, some with a fireplace and private sauna, indoor pool, whirlpool, saunas and outdoor hot tubs. The Maligne Lodge also offers rooms with full kitchenettes, ideal for families, groups or guests planning extended stays. 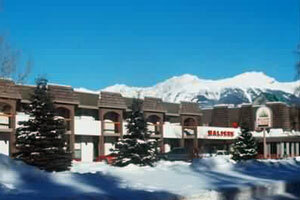 Contact us for more information or to make this hotel part of your Jasper Ski Holiday. Yes. FREE if lift passes are pre-purchased through us.